Welcome to day 15 of my Countdown To Christmas Cookie Recipes. 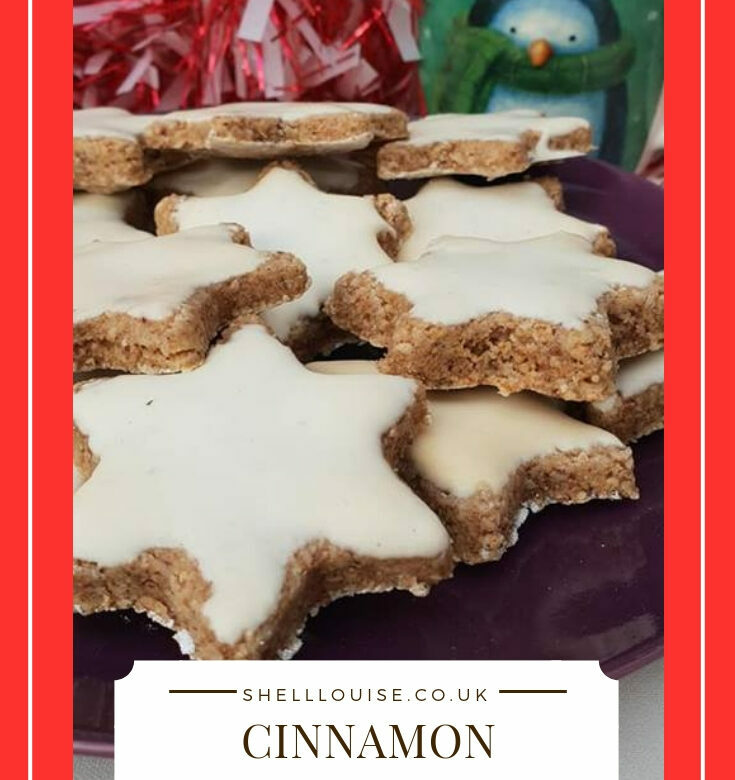 Today’s recipe is for Cinnamon Stars. Tomorrow’s recipe is for Blueberry, Cranberry & Cinnamon Cookies. Whisk the egg whites in a clean dry bowl until stiff. Stir in the sugar until thoroughly combined and then continue to whisk until thick and glossy. Remove 40g of this mixture and set aside then fold the hazelnuts and cinnamon into the remaining mixture to make a very stiff dough. Preheat the oven to 140°C/275°F/Gas 1. Line 2 baking sheets with baking paper. Roll out the dough to 1cm thick on a surface amply floured with icing sugar. Cut the dough into the shapes using a 5cm star-shaped cutter, dusting with icing sugar to prevent sticking. Re-roll as necessary until all mixture is used up. Place the cookies on the prepared baking sheets, spaced well apart and spread the top of each star with the reserved egg white icing. Bake in the preheated oven for 25 minutes, until the cookies are still white and crisp on top but slightly soft and moist underneath. Turn off the oven and open the door to release the heat and dry the cookies out in the oven for 10 minutes. transfer to wire racks to cool.